Fertility problems are highly associated with endometriosis, and it is thus the sixth fundamental symptom of the disease. Infertility is often defined as the inability to conceive of a child. However, in endometriosis cases infertility can also take the form of a female not being able to carry a pregnancy to full term, often suffering miscarriages. While endometriosis does not directly cause infertility, patients who have the disease will have a significantly lower chance of getting pregnant. The American Society for Reproductive Medicine states that endometriosis can be found in up to 50 percent of infertile women and patients with endometriosis typically suffer from infertility in about 30 to 50 percent of cases. 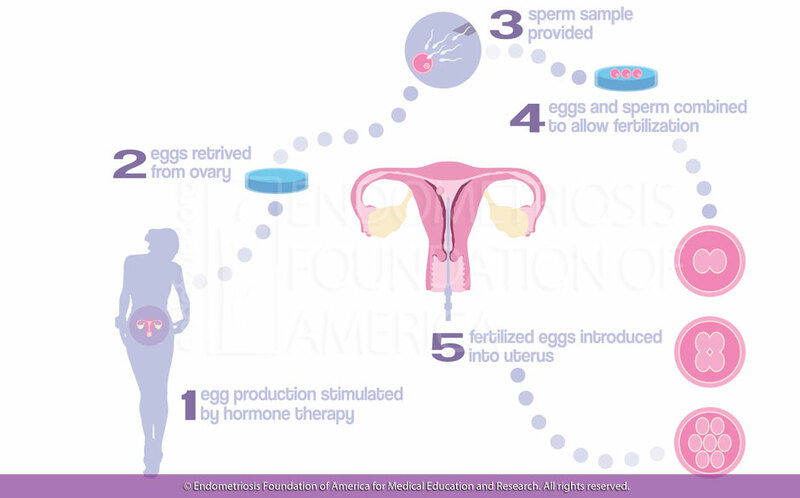 How does endometriosis cause fertility issues? 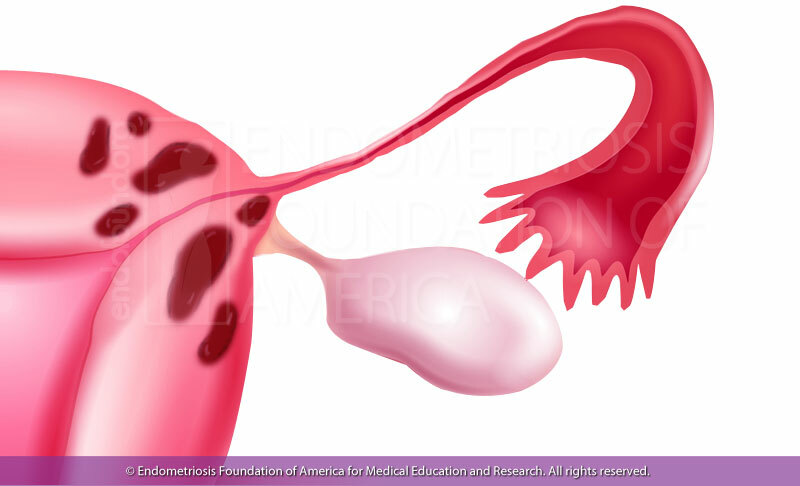 While the exact etiology of endometriosis is unknown, there are several reasons that can be put forth connecting the disease to infertility cases. The first reason concerns the unfriendly molecules produced by the inflammation of endometriosis. These molecules (cytokines) have a paralyzing effect on the sperm and the egg and prevent the fertilization process. The second reason is that endometriosis physically distorts a woman's pelvic anatomy. Again, the inflammatory process changes the fine transparent texture of the peritoneum. It produces scarring and adhesions, which can cause the fallopian tubes and ovaries to become blocked, preventing the sperm and egg from coming into contact with each other. Further, the ovaries may fail to ovulate, causing eggs to become trapped in the ovaries. These obstacles in a woman's reproductive system can prevent pregnancy or cause very complicated pregnancies, including miscarriages. While endometriosis can, and often does, prevent a woman from getting pregnant, by treating the endometriosis itself, patients find that their infertility symptoms can improve. Even those with stage III or IV endometriosis find differing results following deep-excision surgery. This is because abnormal endometriosis tissue is removed and pelvic organs are restored to their normal state following a successful excision surgery. Although no doctor can guarantee that deep-excision surgery will definitely be a success, pairing it with any of the following assisted reproductive technologies (ART), can give the hope of bearing children. 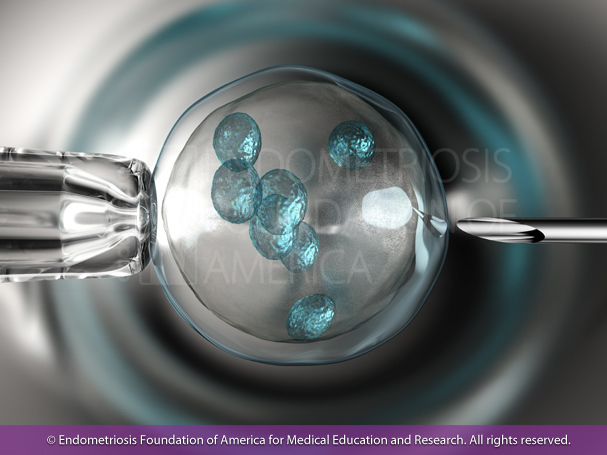 In vitro fertilization (IVF): This is perhaps the most common form ART, in which a woman's eggs are collected and fertilized by sperm in a lab, then implanted in her uterus. Intrauterine insemination (IUI): This method injects a healthy sperm cell directly into the uterus in order to ensure implantation with proper timing during a woman's menstrual cycle. Third-party assisted ART: These third-party ART techniques are used either by themselves or in congruence with other ART methods. This can include, egg and sperm donation or surrogate or a gestational carrier. The former is used when the female is incapable of producing healthy eggs, while the later is used when the woman simply cannot carry a pregnancy. With the assistance of reproductive technology, some endometriosis patients have been able to overcome infertility due to endometriosis. Many times, a woman who has difficulty conceiving will have a case of endometriosis that does not come with severe symptoms. This is known as silent endometriosis. These silent sufferers eagerly crowd into the waiting rooms of in vitro fertilization (IVF) clinics and reproductive specialists with the hope of conceiving. However, these women are often not told they may have endometriosis, and the in vitro attempts they take will generally fail. If these patients question the possibility of endometriosis as the cause for the failure, they are usually falsely assured by their fertility specialist that endometriosis does not have a negative, or even significant, impact in conception. Sometimes, physicians will even claim that pregnancy will cure a patient's endometriosis. By the time multiple IVF attempts have failed, these patients, at this point between thirty-five and forty years old, are told that their ovaries have no reserves left and that egg quality is poor. But when endometriosis is removed by excision surgery, inflammatory tissue from the ovary and around the fallopian tubes is also removed. As a result, patients may not only increase their rate of success with IVF but also, not infrequently, get pregnant naturally without assisted technologies. Women with endometriosis cannot have children. Although endometriosis is a leading cause of infertility, many women are able to get pregnant after a quality excision surgery and/or with the use of reproductive technology. There are many factors that influence the ability to get pregnant and carry a pregnancy to term. Many physicians, especially in regards to infertility cases, will assume a hysterectomy is a proper treatment for a woman's endometriosis. They will see a history of miscarriages, stillbirths, and other fertility issues and simply assume the woman is infertile. At this stage, it is important to remember that hope is not lost. If an aspiring mother is having difficulty becoming pregnant or delivering a child, and there is a suspicion of endometriosis due to other symptoms, then they should certainly consider endometriosis treatment options, particularly excision surgery, as a way to improve their chances of conceiving. Many women suffering from endometriosis have found success through reproductive technology or excision surgery, or a combination of both. A hysterectomy should only be conducted as a last resort, with the patient's knowing consent that if conducted, they will no longer have any chance of becoming pregnant. Carlo Bulletti et al., “Endometriosis and infertility.” Journal of Assisted Reproduction and Genetics. August 27th, 2011, p: 441-447.